What Can I Take for a Chest Cold That Is Safe for Pregnant Women? Colds are common during pregnancy. Since pregnancy affects your immune system, your symptoms might last longer than they would otherwise. If you need drugs to relieve the symptoms, take them only on a short-term basis and follow the recommendations of Pharmacist’s Letter/Prescriber’s Letter to select a drug that had been on the market long enough for the accumulation of data about its effects on the baby. Do not select a new drug. Testing for drug safety does not include pregnant women, since there might be risks to the baby. Before taking any medication, especially during the first trimester, discuss the risks and benefits with your doctor. The University of Michigan Health System recommends taking no medication during the first trimester or after 38 weeks unless your doctor recommends it. To relieve your symptoms, you can try resting more and drinking more fluids. If you are having problems eating, you can try eating six small meals instead of three larger ones. For sinus pain, you can apply warm compresses. To loosen congestion, you can use a vaporizer or humidifier. If you still have no relief, ask your doctor to recommend a safe medication. Pharmacist’s Letter and Prescriber’s Letter are subscription services that keep pharmacists and prescribers informed about new drug therapy developments. These services have no affiliation with any pharmaceutical company. According to Pharmacist’s Letter/Prescriber’s Letter, chlorpheniramine, found in Chlor-Trimeton, is the antihistamine of choice during pregnancy. Cetirizine, found in Zyrtec, is a safe alternative to chlorpheniramine. Loratadine, found in Claritin, is a safe alternative to chlorpheniramine except during the first trimester. Diphenhydramine, found in Benadryl, is safe to use during pregnancy. However, it may be unsafe if used in combination with temazepam -- brand name Restoril -- a treatment for insomnia. Doxylamine, found in some forms of Nyquil, is safe when used in combination with pyridoxine, although products that contain doxylamine contain other agents that might be unsafe during pregnancy. Some decongestants are safe for pregnant women to take on a short-term basis. According to the University of Michigan Health System, pseudoephedrine, found in Sudafed nasal decongestant, is safe after the twelfth week of pregnancy. According to the Pharmacist’s Letter/Prescriber’s letter, oxymetazoline, found in Afrin, Dristan 12-hour and Allerest 12-hour, is the nasal decongestant of choice during pregnancy, except during the first trimester. 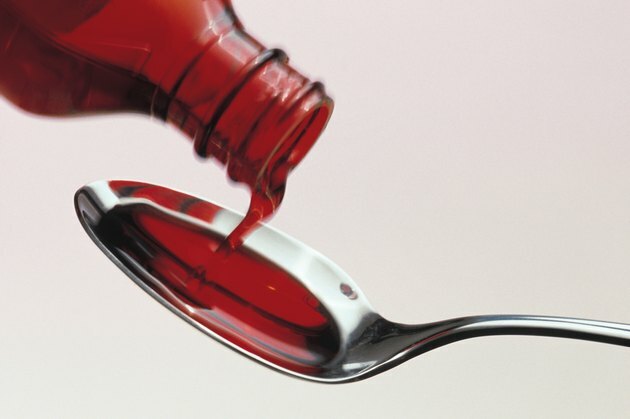 According to Pharmacist’s Letter/Prescriber’s Letter, dextromethorphan, found in Robitussin DM, is safe to use during pregnancy, but some products that contain dextromethorphan also contain alcohol, which is unsafe. According to the University of Michigan Health System, Robitussin, Robitussin DM and Vicks plain cough syrup are safe for pregnant women to take after the twelfth week of pregnancy. According to Pharmacist’s Letter/Prescriber’s Letter, acetaminophen, found in Tylenol, is the pain medicine of choice during pregnancy and is safe when used short-term in therapeutic doses.